Macro lenses are not just one-trick optics for close-ups – making them a must-have prime lens for shooting gardens, flowers, butterflies and jewellery. Modern macro lenses are useful as standard or short telephoto prime lenses with a reasonably fast aperture ratings, making them ideal for portraiture, still life and general photography. Even so, there’s no denying that the main strength of all the lenses in this test group is that they are capable of delivering full 1.0x magnification at their closest focus distance (also known as 1:1 magnification). To put that into context, you can fill the entire image sensor of an APS-C format SLR or mirrorless camera with something the size of a postage stamp, enabling incredible an incredible level of enlargement when viewing images on screen or in print. A focal length of around 90-105mm is often regarded as ideal for macro photography (and particularly so for full-frame cameras), enabling you to get close but not too close to what you’re shooting. With shorter focal lengths, the front end of the lens can end up being so close to what you’re shooting that it can cast a shadow over it, or scare away small bugs and other tiny wildlife that you’re trying to photograph. However, there are some shorter focal length lenses in our group, as you’ll discover as we reveal the best buys. • Do check the lens mount options in the specifications. Some independent lenses come in versions for a number of different camera brands, while own-brand lenses will only fit that maker’s cameras. With this in mind, make sure you select the right lens fitting when you buy online. The latest generation of Tamron’s enviable 90mm macro lenses ditches the gold band around the middle in favour of a silver band at the rear, which should hopefully avoid any buying confusion with the older version. Upgraded optics include two XLD (eXtra Low Dispersion) elements and one LD element, plus dual nano-structure and conventional coatings. Good build quality includes weather-sealed and a keep-clean fluorine coating on the front element. There’s also a ‘hybrid’ optical stabilizer, which counteracts the effects of X-Y shift as well as vibration, enhancing performance in close-up shooting. Even so, it’s no real substitute for a tripod as you near the very shortest focus distance. Despite its budget-friendly asking price (in the UK and Europe, at least) this Sigma lens boasts fast, quiet and accurate ring-type ultrasonic autofocus, a three-position range limiter switch and optical stabilization with dual static and panning modes. Quality glass includes two SLD (Special Low Dispersion) optical elements, and the lens is supplied complete with a soft case, a hood, and even a hood converter to optimize efficiency with APS-C format rather than full-frame cameras. Sharpness is highly impressive and the effectiveness of stabilization is worth about four stops in general shooting, but of little use for extreme close-ups as it’s not a hybrid type, as fitted in the Canon 100mm and Tamron 90mm lenses in the group. Designed exclusively for Canon’s APS-C format DSLRs, this lens features a stepping motor autofocus system which is very quiet and enables ‘fly-by-wire’ manual focusing. As with the larger Canon 100mm lens in the group, it has a hybrid image stabilizer that can correct x-y shift as well as vibration, making it more effective for close-up shooting. With its relatively short focal length, the front of the lens comes to just 3cm from the object you’re shooting, when using the minimum focus distance for maximum magnification. However, its built-in LED ‘Macro Lite’ helps to offset the blocking out of ambient light. Even so, it’s not particularly bright and you’ll need a slow shutter speed of about 1/15th of a second at f/8 (ISO 200). Image quality is good overall but barrel distortion is more noticeable than with most macro lenses. Along with sturdy L-series build quality, Canon’s latest 100mm macro features hybrid optical stabilization, which has since filtered down to the company’s relatively small 35mm macro lens. Typical up-market attractions include ring-type ultrasonic autofocus and a three-position autofocus limiter switch that can lock out the short or long end of the range. The lens also has weather-seals and a UD (Ultra-low Dispersion) element. Image quality remains impressive throughout the aperture range, right down to f/22, helping you to eke out a little extra depth of field. Autofocus is fast and accurate and quiet but, more importantly for most macro shooting, the manual focus ring is smooth and precise. Better working distance than Nikon’s 40mm DX macro lens. Nikon makes a cut-price 40mm DX format macro lens but this is a far superior optic for close-up shooting. Its minimum focus distance is more generous and the inner barrel doesn’t extend at shorter focus distances. The net results is that the working distance from the front of the lens to the target in full 1.0x macro shooting is 14.5cm compared with the 40mm lens’s paltry 3.5cm. Further advantages include VR (Vibration Reduction) and an ED (Extra-low Dispersion) element, both of which are lacking in the 40mm lens. Sharpness is uninspiring at f/3.5 but much better at medium to narrow apertures, more commonly used in macro photography. Ultimately, the Tamron 90mm and Sigma 105mm lenses still have the edge for shooting with DX as well as FX format cameras. 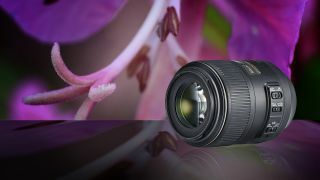 This is Nikon’s top-flight FX format macro lens, although it’s equally attractive for shooting close-ups on DX cameras. Like the 85mm DX lens in the group, it includes a ring-type ultrasonic autofocus system with fully internal focusing, 3-stop VR II stabilization and Nano Crystal coating. Both lenses also feature 14 elements in their optical paths with a single ED element. As FX format lenses need to produce a larger image circle, to cover the bigger image sensor, the 105mm is rather wider in diameter. The working distance from the front of the lens to the subject at the minimum focus setting is very similar, at 15cm compared with the DX lens’s 14.5cm. The VR system is effective for general shooting, similar to that of the Sigma lens, but lags behind the performance of Canon’s and Tamron’s hybrid stabilizer for close-ups. Image quality is good overall with impressive sharpness across the whole frame. Compact and lightweight yet well engineered. The Micro Four Thirds system is a good fit for telephoto and macro photography, the 2x crop factor delivering double the ‘effective’ magnification from a lens that’s compact and lightweight yet beautifully built and comes complete with weather-seals. Stepping motor autofocus systems are renowned for their virtually silent operation but rarely feature a focus distance scale. This lens’s smart focus distance/magnification indicator is a bonus. Due to its relatively short focal length, the minimum focus distance is just 20cm, compared with around 30cm for many macro lenses. At maximum magnification, however, the working distance between the front of the lens and the subject is reasonably usable, at about 10cm. Image quality and handling are very good in every respect, making this our favourite MFT format macro lens, and not just the best option for Olympus mirrorless cameras, but for Panasonic G-range cameras too.. Weighing in at 1,150g, this is a comparatively big and hefty macro lens, due to its uncommonly long 150mm focal length, while retaining a fairly fast f/2.8 aperture rating. Like most modern macro prime lenses, however, focusing is fully internal so the lens doesn’t physically stretch at shorter focus distances. Build quality and handling are essentially the same as in the Sigma 105mm lens, which is no bad thing. Common features include ring-type ultrasonic autofocus, dual-mode stabilization for static and panning shots, and a three-position autofocus range limiter switch. Again, the lens is supplied with both a hood and an APS-C hood converter, plus a padded soft case. You also get a tripod mounting collar with the 150mm lens, enabling a better balance especially in portrait orientation shooting. The number of SLD optical elements goes up from two to three, and the lens gains an APO (Apochromatic) badge in the process, although colour fringing proved no more minimal than in the 105mm lens. Image quality is very pleasing, with excellent sharpness across the whole frame, throughout the aperture range. Typical of Sony’s recent G-series and G Master lenses, there’s no shortage of quality in this 90mm macro prime. It’s fully compatible with full-frame and APS-C format E-mount cameras, and packs plenty of high-tech features, including a Dual DDSSM (Direct Drive Super Sonic wave Motor) autofocus system for rapid, accurate and near-silent performance, plus ‘Optical SteadyShot’ stabilization. The optical path includes aspherical, ED and Super ED elements, built into a precision-engineered, weather-sealed metal casing. Handling benefits from a super-smooth and precise focus ring, with an electronic fly-by-wire coupling. There’s also a three-position autofocus range limiter switch and a focus hold button. Image quality is outstanding but it’s a pricey lens to buy.